TAKING PROFITS AGAIN. AND SELLING. April 1 2019. We are selling GLOPPRA GasLog Partners, locking in a very nice 13% profit from a relatively short holding time. BUYING a Corporate Bond that is on sale, giving us a 12% to maturity within a short time frame. It matures in August 2020. CSI Compressco LP provides compression services and equipment for natural gas and oil production, gathering, transportation, processing, and storage applications in the United States and internationally. It fabricates and sells standard and custom-designed compressor packages, oilfield fluid pump systems, and compressor package parts and components, as well as provides aftermarket services, such as operations, maintenance, overhaul, and reconfiguration services. The company offers GasJack and VJack electric powered low-horsepower compressor packages to provide production enhancement services. It also provides medium-horsepower compressor packages to move natural gas from the wellhead through the field gathering system; and high-horsepower compressor packages that are primarily used in midstream applications. Here is a website that we discovered recently. They write in an easy to read format that we can actually understand!! March 29, 2019. When you are in this investing racket full time, as we are, you tend to spend time in the financial chat rooms. One topic that keeps coming up is the risk of over-weighting individual positions. Yesterday we were reading about someone who had a large position in a Company that was imploding. A good example of this is General Electric GE. We know there were a lot of people, and employees that were over-weighted and got hurt in the recent decline of GE. Never, never put more that 4% of your portfolio in a single position….and if it’s risky, make 2% the limit. Yes we admit to making this mistake in the past, and losing money. Don’t make the same bad decision that we have made. Good News. MadDog Maddow on batshit crazy liberal MSNBC: ratings collapse. Investors out there are so consumed with the Mueller investigation and general corruption in the FBI and DOJ , they are NOT watching what is REALLY going on in the stock and bond markets. We are posting excerpts from articles below with links to the full articles. You really need to read what is going on. Economies are slowing. Rates are declining and there are growing dangers of recession next year. If you are heavily invested in stocks (not us), you ESPECIALLY need to stay aware of changing conditions. In our opinion, income-oriented investments are the best choice going forward. March 27, 2019. We have recently been selling Core Portfolio positions as they have appreciated, and we wanted to lock in profits. But there is now a larger cash position than wanted. As the markets have been crawling higher, potential buys that are ‘on sale’, which we prefer, are almost non-existent. Tuesday morning, it appeared we could get NEWT at a good price…there was some ‘bad news’ that came out which caused the price to drop. But right out of the gate, it spiked higher so the ‘bargain’ disappeared. We are STILL watching IRM but it too has started trending up and beyond the price we want. As of right now, there is nothing to buy. We are simply not going to pay too much. Sometimes if you just wait, bargains usually appear. Conditions change on a daily basis and we really want to put our cash to work. XLF, the financials, have been trending down for a whole year. which is not good. (You MUST have the banks on your side: XLF is a leading indicator for us.) And declining interest rates also tell us the economy is not great. The inverted yield curve, which is all over the news, is indicating a possible recession in the future. So it appears we may have a pullback in the markets, which would give us some buying opportunities. UPDATE; We may have an opportunity to buy NEWT on sale. Watch for details. We own NRZ in the Core Portfolio. You should consider buying or adding to the position. Here is an excerpt, and a link to the full article is below. The stock’s book value is $16.25, yet shares trade barely above this level as I write. This means you and I can buy NRZ for the liquidation value of its investments and get the rest of the business for free. You want “Medicare for all”? Do you really believe the liberal crack-head Dem’s that tell you we can afford this? Here is what happened in Finland. March 22, 2019. It is becoming apparent that interest rates will continue downward. 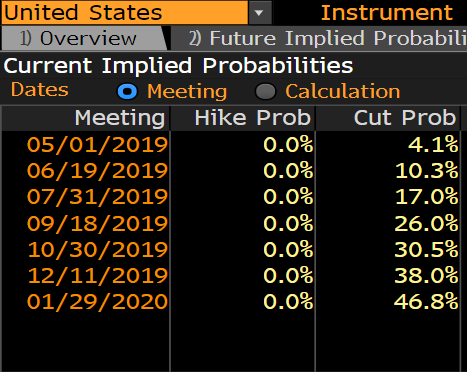 And in fact, traders are now expecting a cut by next year: exactly opposite of what we have been anticipating. We are selling this floating rate Corporate Bond today, and may be selling other positions in the Core Portfolio. We strongly recommend you read the excellent article linked below. SELL CITI CUSIP: 1730T0G78. We bought this in 2014 and have a very tiny loss….the loss will get worse if you continue to hold. It was purchased with the expectation that rates would rise. March 21, 2019. We bought LMRK on March 13, about a week ago. This position is UP a stunning 14% an amazing gain in a short period of time. Altho the momentum is still positive, we are SELLING and locking down profits. We never expected this type of action, but it is our policy to sell and take profits. March, 20, 2019, If you had owned ONLY stocks, the SPY which is the top 500 stocks, over the last 15 months, you would have a Total Return of 1%. That’s right, one percent. If you owned our dividend paying Core Portfolio, you would be up around 5-6 percent. Quite a difference. It is becoming obvious that Trump is going to have a very difficult time winning next year. The average American does not give a damn about N Korea, China or Mexico. They DO care about free college, reduced student loans, free health care, and taxing the rich. Voters really do not care how the government is going to pay for it. The ultra left liberals have a very good chance next year. Of course Trump’s continued Twitter tirades don’t help the matter. We bought CGBD back in June 2017. The total dividends received do NOT equal the stock value which is DOWN 17%. So in terms of total returns, we are in the RED on this position. Bummer. We have continued to hold this damn thing in hopes that we could at least break even. So far, no dice. There is an article in SeekingAlpha.com which suggests you BUY CGBD. This highly regarded author explains all the reasons for the poor performance and makes the case for adding this to your portfolio. We have no intention of adding to our position, but we will CONTINUE to hold. The technical indicators are pointing UP and if you decide to buy, we suggest starting with a small amount. CGBD is currently underpriced compared to its peer group which are BDCs with higher quality management and portfolios, excellent dividend coverage and current dividend yields between 9% and 10%. Some of the potential reasons for being underpriced include the recent NAV decline that is partially due to the Q4 2018 special dividend and higher quality management conservatively valuing the portfolio as well as semiannual releases of pre-IPO shares “that puts enormous technical pressure on the stock”.